Even during the Cold War there was a Ford in your future. Before the infamous U-2 incident (the plane, not the band . . .for you who may not know), there was a decided thaw in the Cold War between the U.S. and the Soviet Union. Cultural exchanges were arranged, there was a little less jamming of Radio Free Europe and Soviet Life,a sort of “feel-good Kremlin” glossy magazine was published. And in 1959 the U.S. was invited to set up a pavilion for the Moscow Fair, as a goodwill gesture. This was also the setting for the now-famous Kitchen Debate between vice-President Nixon and Soviet Premier Khruschev. So curiosity was high in the U.S. over Soviet reaction to seeing certain snippets of “daily American life”. And when the fair was over, a lot of questions were posed to the Guides who worked the Fair. The result was this special radio program, produced by CBS News and broadcast on September 13, 1959. And the honeymoon was on . . . for a few months anyway. 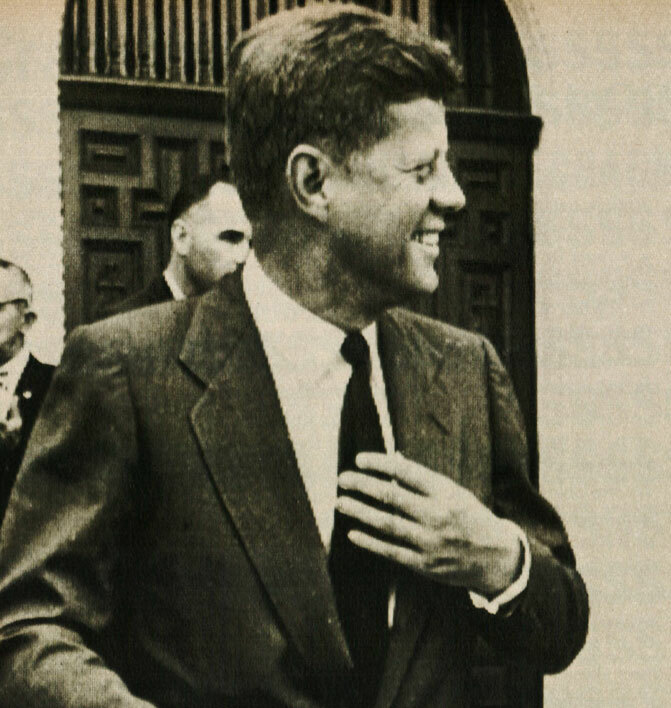 Fourth Of July – 1962 – President Kennedy Celebrates A Cold War Fourth. In the midst of turmoil, a reminder we’ve come a long way. The Fourth of July in 2013 is full of turmoil and uncertainty. Oddly, the Fourth of July in 1962 was almost exactly the same. The world in the midst of Cold War. The upheaval of former colonies. The Civil Rights movement. Changing value systems. The status of our nation as a whole – what kind of people had we become. We asked those questions in 1962 and we’re asking those questions again in 2013. Some things will forever stay the same as long as they’re being done over and over again in the hopes of a different outcome. Yes . . .I know. Insanity. But as a reminder of how tenuous this all is; a reminder of the fragile balances we often keep up and the prevailing optimism that everything eventually works out, here is the Fourth of July, as celebrated in 1962, with an address by President John F. Kennedy. Enjoy the Fourth. Keep an eye on the four-legged folks. Don’t get too loaded. Don’t make any big promises. Anticipate your hangover tomorrow. Designate a driver. Stay away from arguments. Consider us all in the same boat.